Have you ever seen a look from a magazine, Fashion Week, or a campaign and think “Ahhhh I love this but how in the world do I do it??? ?” I love showing my followers how to recreate fabulous looks in their own lives. Let me introduce you to a beautiful updo and step by step instructions on how to do it for yourself!!! This beautiful look was created by Yann Varin for the Emilio Cavallini Fashion show in February. 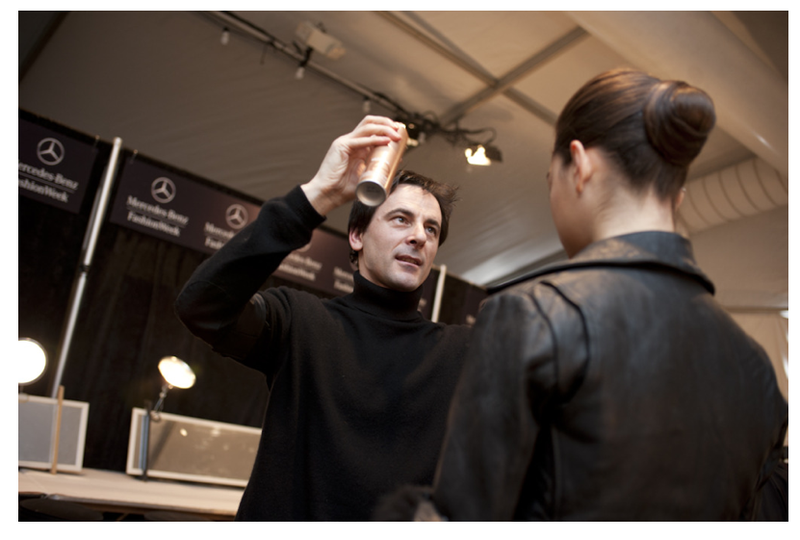 I had the pleasure of meeting Yann a few months ago at the Women’s Health Fashion Show and fell in love with his work. I was thrilled when we decided to partner up to show Loftiss Says readers how to recreate his signature look from this years Fashion Show! Step 1: Separating the hair. You find your part (mine is basically center )and divide in three sections. I found this fascinating. I usually separate my hair, leaving the pieces around my face last but never dividing into three sections. I also was amazed to learn that you need to separate the hair BEHIND your ear (I always parted mine at the top of my ear). Yann explained that it was easier to hide your part in the back when it was behind your ear. Wow this is only Step 1 and I’ve learned so much!!!! 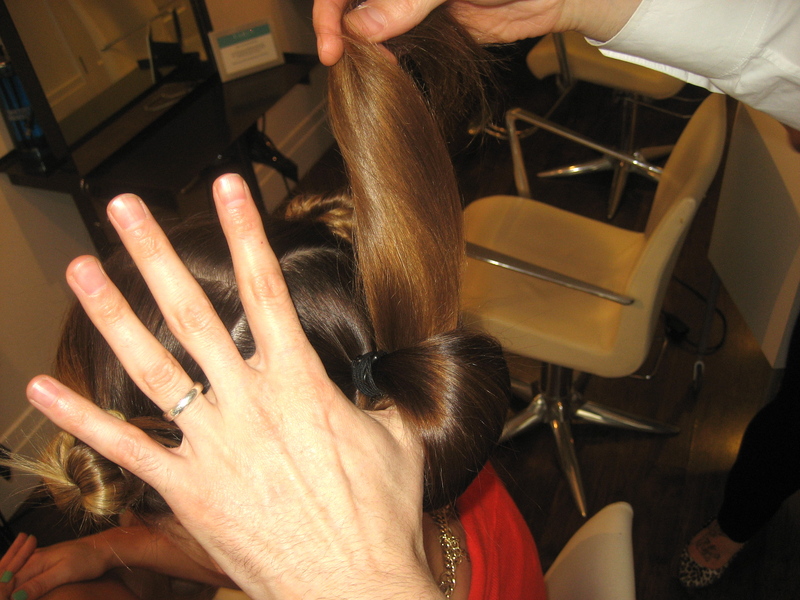 Step 2: Fold the ponytail under and hold the loop with your thumb. Step 3: Bobby pin to secure the loop is secure. A great hint by Yann is to thread the bobby pin through the ponytail holder. It will ensure your hair won’t fall out. *Yann used only L’Oreal products on my hair. You can read my love for L’Oreal products here. This is the foundation of the hairstyle. Don’t be afraid to use a good amount of pins. *No one can see underneath your hair. Take advantage of that! PIN AWAY! You will see the “knob’ begin to grow. And the overlapping of hair will show the beautiful highlights in your hair. Yann places a few pins in the “knob” to train the hair where to go. At the end of the look, the pins will be removed after the hairspray is applied. Step 6: Take down the LEFT side of your hair and wrap clockwise. *Again remember to place your bobby pins through the ponytail holder to really secure the look. Next the pins are removed because the hair is set and not going to move. VIOLA!!!!! The look is done! Here is the finished product standing next to the genius Yann Varin. I must have received 10 compliments on my hair after leaving the salon. This is really an easy look to recreate and it puts a twist on the updo! Tags: beauty, beauty event, Beauty expert, beauty products, beauty tips, beauty trends, catwalk, hair, hairstyles, L'Oreal, red carpet, red carpet looks, style, Yann Varin. Bookmark the permalink. This was a great post! I was able to do it with your clear directions, and I loved the look! Thank you! I have a question – what hair style would look best with a one-shoulder casual dress? I have a date night coming up and want to look Loftiss-good!